Hello friends! Summer is flying by and we may be enjoying ourselves a little too much (thus the lack of blog activity). 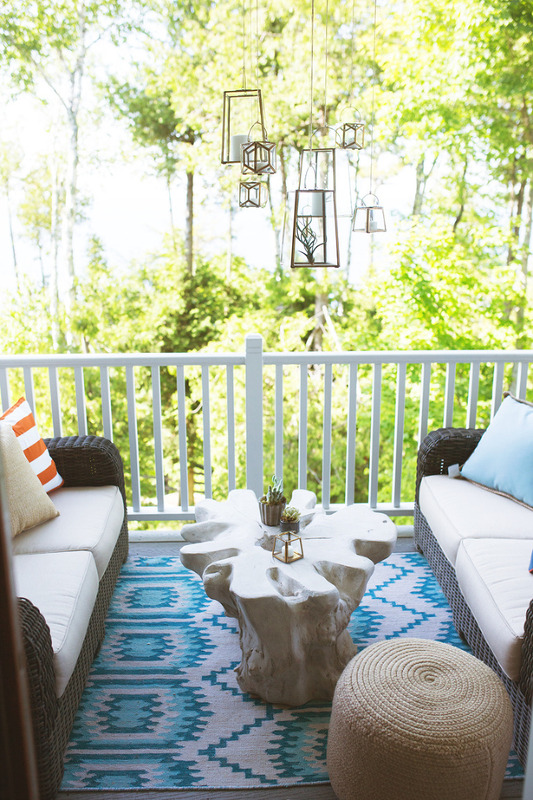 We recently took at road trip to the Wisconsin peninsula, known as Door County, to help design and style an outdoor space at our friend’s lake house. 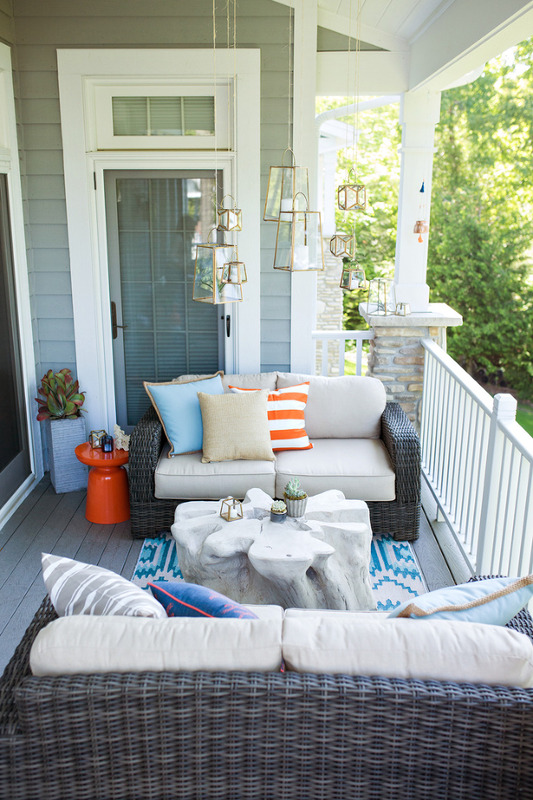 We collaborated with the talented group at Branching out and Co to help style this outdoor oasis and of course invited some extras to break in this serene little space. It was a fun + challenging project putting the pieces together and the planning started back in February (see patio layout at end of post here). The patio space is actually a balcony on the 2nd level connected to the indoor living area. 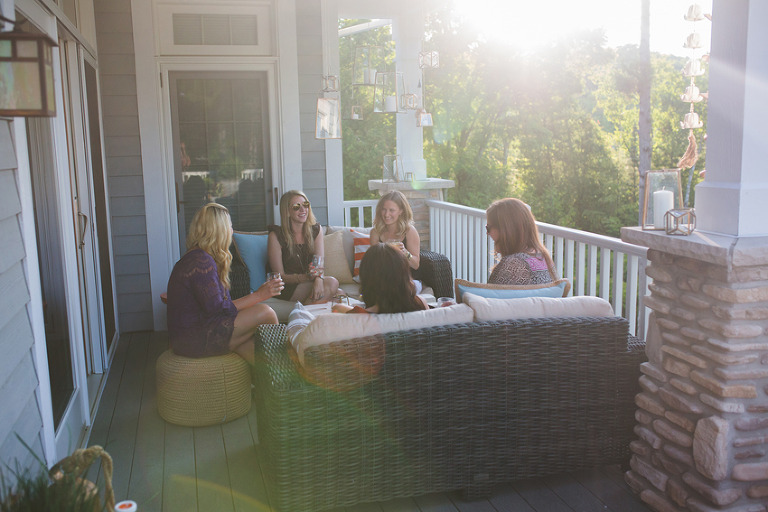 Our friend wanted a functional space for entertaining + relaxing. Since the patio is long and narrow, we decided on two separate seating areas to maximize the flow without sacrificing the breathtaking views. 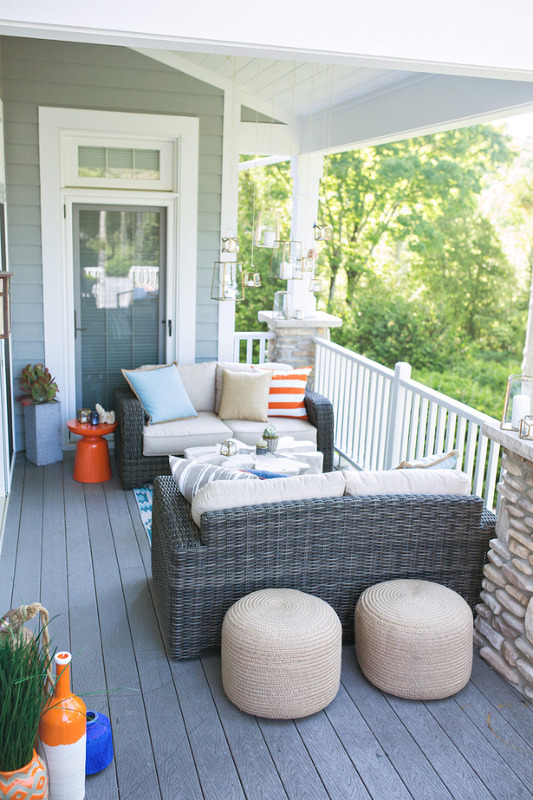 Style, comfort and quality were priority when selecting the outdoor furniture, along with items that were low maintenance. The seating pieces are Brown Jordan found exclusively at The Home Depot and they go together effortlessly to create a casual, coastal-chic look. We also love the fact that pieces are sold individually; that allowed us to really customize the space and create an eclectic look . The all-weather woven loveseats are part of the Northshore Collection and the lounge chairs are from the Form Collection. All of the Brown Jordan collections found at The Home Depot come in a variety of Sunbrella fabric choices, making it easier than ever to create a unique look! We then added some textural accent pieces and budget-friendly pops of color with orange side tables and colorful toss pillows to tie everything together. As you can see below, the space is tester-approved! Hope you’re enjoying the great outdoors and if you’re still in the market for outdoor furniture – don’t delay! There are lots of deals going on now – especially online. *More details and product info below. Lanterns – Anthropologie (sold out similar here here here). Hung with twine and S-hooks for easy removal in windy conditions. Make sure the twine is strong enough – we had a few casualties! Thin string/rope works well and achieves the same look. Outdoor poufs 21″ (so versatile for extra seating) // vases, planters and succulents Branching out and Co // blue toss pillow // natural pillow // striped orange pillow cover and tan stripe pillow cover – ONLY $5.95! Form Lounge chairs (can be used with or without seat cushion – and have motion!) Shown with sparrow colored seat cushions on back chairs.